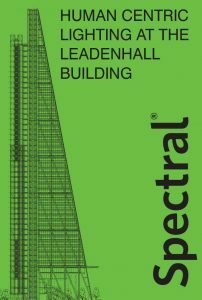 Rogers Stirk Harbour and Partners chose Spectral IRIS to light their new offices on the fourteenth floor of the iconic Leadenhall building they designed. They loved the transparent nature of the fitting which subtly exposes the internal components. 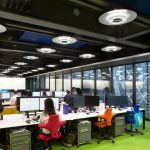 Having assessed an LED sample version, they appointed world renowned lighting consultants Speirs and Major who specified the fitting should feature a colour-temperature tuneable LED version. 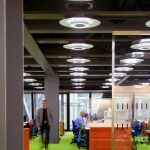 IRIS was to be suspended from the ceiling with the addition of surface-mounted versions recessed into special perforated metal ceiling plates. During consultation with the engineers, ARUP’s, the concept of mounting IRIS to data bus track and controlled via DALI was born. It would be very simple to install as the track connector would supply power and control to each IRIS luminaire as well as mechanically fix it to the ceiling. In addition, the architects wanted each IRIS to be mounted onto a very shallow trimless spun aluminium dish about 750mm in diameter and finished in white. The exposed services and ceiling in the space were beautifully detailed and predominantly colour coded in dark gray. 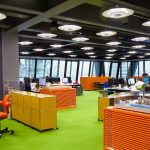 By adding the dish, contrast would be reduced and being white it would provide an amount of visual brightness and strong visual language to the open office spaces. The architects moving in date meant that Spectral only had nine weeks to develop the fitting and deliver to site. Each fitting would be linked to a DALI control system which responds to daylight intensity, whether the fitting is at the perimeter of the building or the centre. 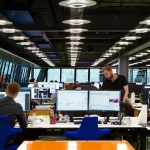 Speirs and Major wanted the general lighting system in the studio and adjacent open areas to change colour temperature during the day, according to a pre-determined profile corresponding approximately to the behaviour of sunlight moderated by atmosphere. 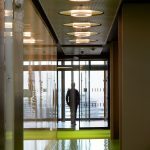 The system will respond to daylight intensity via sensors at the perimeter of the floor plate, reducing output of artificial light where daylight allows. In practice this will mean a gradual increase in intensity from perimeter to centre of footplate. Incredibly, each IRIS fitting consumes only 25 watts. Its lumen and power efficiency are exceptional. Work place lighting regulations require a level of optical control to ensure comfortable working environments. Iris achieves this by having a clever radial lens in front of the LEDs. The formation of the LEDs is radial which creates a better uniformity of light. The architecture of the ring shaped printed circuit boards for the LEDS was designed and manufactured in house. Using latest Alucore PCBs heat is taken away from the LED chips and dissipated to maximize the life of the light fitting. By carefully adhering to the LEDs power and output specification we optimize the balance of light output and longevity. The LED emergency component is particularly neat as its recessed into the colour coded centre disc that matches the specially designed trunking system, and is exceptionally well integrated. Jon Estell, head of design, Spectral Lighting. 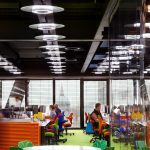 ‘Rogers Stirk Harbour + Partners moving into Leadenhall represents an innovation for all involved – a city tower is not the typical home for a leading architecture practice. 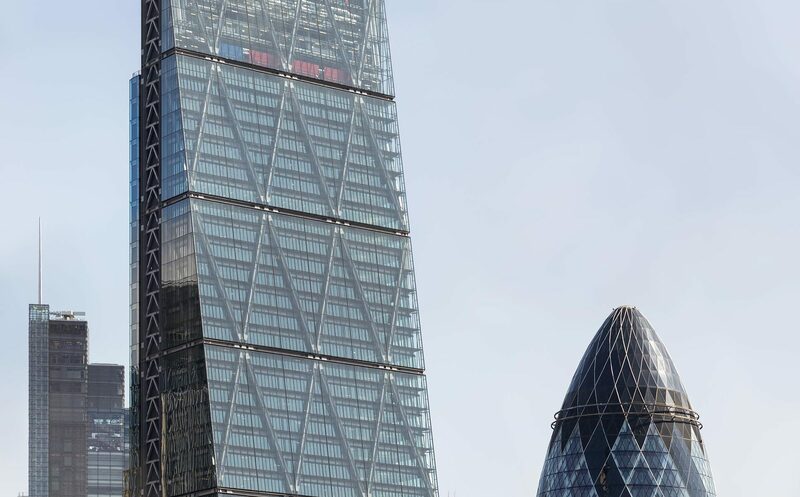 However, the firm are moving right into the heart of their own portfolio – the Leadenhall building itself and a great view of the iconic Lloyds Register building opposite. 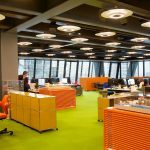 With both these factors in mind, the architects set out to create a definitively creative studio space within a spec office floorplate. The intelligent use of various aspects of technology has been key to achieving this. As long-term collaborators on a variety of projects, Speirs + Major were asked to lend a hand with lighting. Next PostNext University of Hertfordshire – The new science Building.